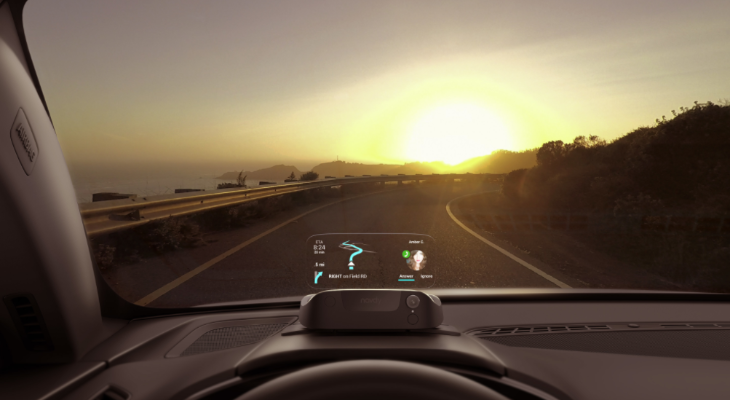 Navdy calls itself “the world’s first augmented driving device.” It links up with iOS and Android smartphones and projects information onto a small transparent screen that sits directly in front of the driver. So it really does augment your driving experience. Opening the box- Navdy costs $599 and with a price like that, I have high expectations for everything, including packaging. The device is shipped in a slick, square black box, inside of which are four stacked trays of various components. Impressive and intuitive. I thought I might be able to hook it up without even reading directions. Installing it- I deferred to the quick start instructions, and getting it all hooked up took me 30-40 minutes. First I unloaded everything in the box and laid it out in the passenger seat. Next I cleaned the dash (with a special wipe in the box) and placed the sticky side of the rubber mount directly in front of the steering wheel, then snapped in the Navdy unit, flipped up the clear screen and removed its protective sleeve. Then I took the cord and ran it down the left side of the dash and under it where it plugs into the car’s onboard diagnostics (OBD) port– that’s for power and also to let Navdy know what’s going on under the hood, like when the car is low on gas. I also wrapped its small rubber control dial to the steering wheel, which is used to scroll through menus on the screen. Downloading the app to smart phone- Navdy works in tandem with your smart phone, so you need to download an app to synch everything. Once connected and enabled, Navdy allows you to answer calls using a swipe of your hand, and then talk via your car’s Bluetooth system. It will read texts to you. This is how it keeps your hands off your phone when you are driving, but also allows you to remain completely connected. The dial mounted to the steering wheel allows you to scroll through menus, or even access Siri. Trying it out for the first time- It felt like something out of Star Wars or a fighter jet, looking out the windshield and simultaneously looking through a moving map of my car on the grid of San Francisco. I was able to easily adjust the lens to my eye level. The map was bright and crystal clear. Using “glances” I can see heavy traffic ahead, fuel, who is calling me, and what’s playing on the stereo. If I wanted it to, it would even show my calendar, my Twitter and Facebook alerts and Gmail headers, but I feel like that’s just a bit too much info, so I did not enable those functions. When driving, the device uses its own maps, which is fine, but I have grown accustomed to using Waze, which is currently not available on Navdy– so there will be a bit of a learning curve. Using hand gestures- The Navdy device has a motion sensor, so I’m able to accept calls by swiping my hand right over the steering wheel. Swiping left hangs up. Pretty cool! Parking- Living in San Francisco, I have it constantly drilled into my head never to leave anything of value (or perceived value) in sight in a parked car to avoid theft. The Navdy device is discreet, but it’s right there on the dash– however it’s not all that difficult to remove (it’s magnetically attached to the mount) and stash under the seat. Overall, I really liked it. If I had a job that required frequent car travel, it would be a dream come true… almost like sitting at my desk while behind the wheel, fully connected, but hands-free and compliant with increasingly stringent driving laws. For a limited time, Navdy costs $599. If you don’t like it, you can return the unit within 30 days for a refund. For details, go to www.navdy.com. 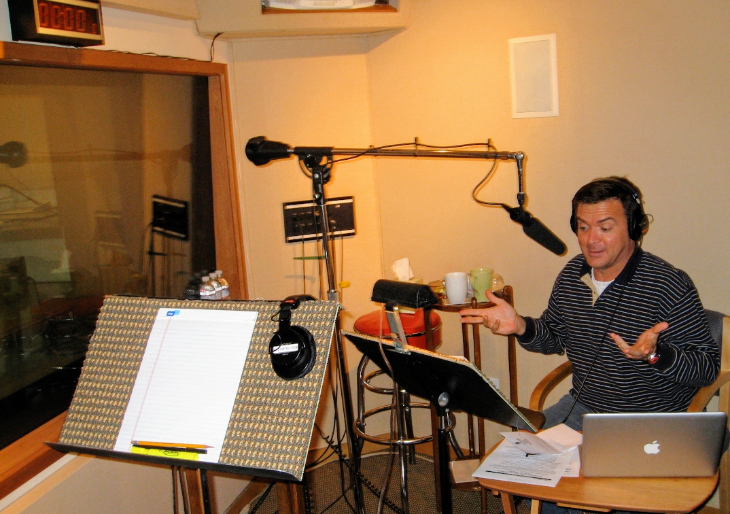 Listen to TravelSkills editor Chris McGinnis discuss the outlook for holiday travel on KCBS Radio. 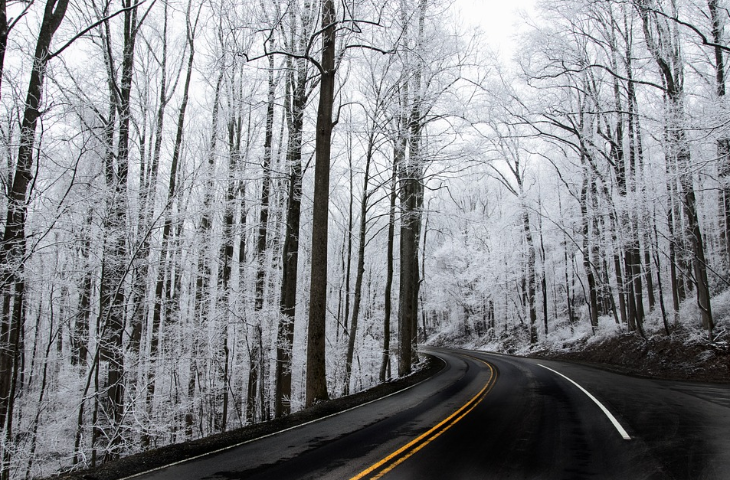 The holiday travel season can be the best of times or the worst of time for frequent travelers. Best because it’s a time for us to kick back, relax and enjoy some time off work with our loved ones. Worst because of all the hassles and high prices involved in getting there. A word of warning: Holiday travel could be crazier this year than in previous years. Why? High demand and the calendar. And weather is always the wild card (for example, there’s snow in Denver and 2.5-hour rain delays at SFO as we write this). Advance bookings at Best Western’s 2,000+ hotels in the US from November 15-January 15 are up 6.1% compared to this time last year. The number of nights booked is up 10.5%, which means those who are traveling are planning to stay longer. In Canada, advance bookings and the number of nights booked are both up 13%. AAA expects 48.7 million Americans will travel over Thanksgiving- that’s a million more travelers than last year, and the busiest Thanksgiving since the great recession of 2007. The trade group Airlines for America expects Thanksgiving air travel to be up 2.5% over last year, which means 55,000 more travelers on planes and atairports every day across the country. Thanksgiving will be the pretty standard this year, with busiest days on the Wednesday before the feast and the Sunday and Monday after. But you should also be aware of big crowds and delays on the Friday and Saturday before Thanksgiving, too. That’s because more people are taking the whole week off. My advice: Make your trip short and sweet: Depart early Thanksgiving morning (the slowest day) and get home in time for the feast. Then fly or drive back on Friday or Saturday before the Sunday rush. For Christmas and New Year’s, expect the busiest days at airports and freeways to be the Thursday and Friday (Dec 22-23) before Christmas. Since New Year’s Day is on Sunday, you’ll see heavy traffic that afternoon as well as on the Monday and Tuesday after New Year’s (Jan 2-3). While most major media focus on air travel during the holidays, the reality is that nearly 90% of holiday travel is by car. And since most of Best Western guests arrive by car that 6.1% increase in demand is a good indicator of how busy roads will be this year. In addition, record low gas prices and fear of airline hassles will be pushing a lot more Americans into their cars for holiday trips. One key reason for high demand for travel during in the months ahead is the declining price of gasoline. 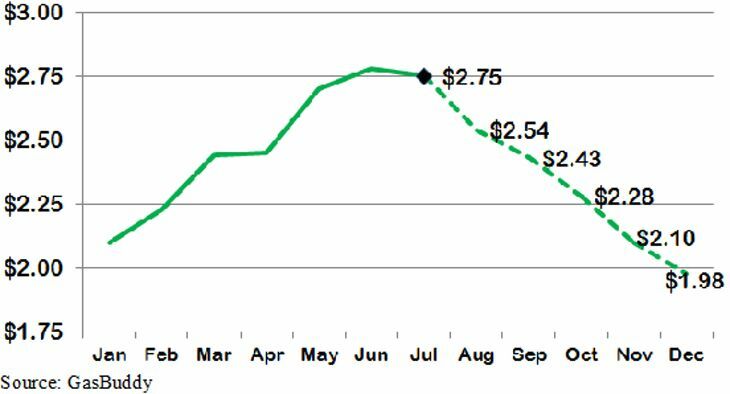 Currently, the average price per gallon nationally is about $2.15—down from a high of about $2.35 in June. Those driving in the Midwest will find the least expensive gas this year ($1.70/gal)- those driving in the West will pay the most (>$2.50/gal). Airlines are enjoying the dip in fuel prices, too, which means that holiday airfares, while always high, will not increase much this year compared to last year. Some fares might even decline slightly. Would you consider spending the holidays in Europe? If you’ve been waiting around for a deal, this might be the year to go. 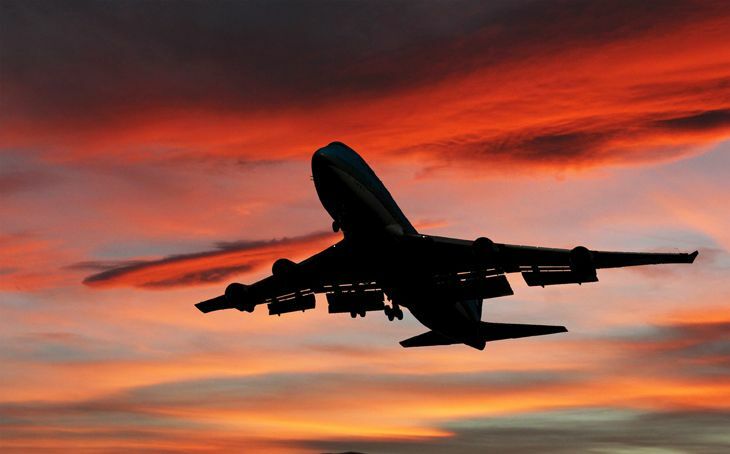 Transatlantic airfares are at new lows due to increased competition and low fuel prices. Plus, major currencies have tumbled in relation to the dollar. As I write this, 1 euro is worth about US$1.07 and is approaching parity. The British pound is at about $1.24. When’s the best time to buy airline tickets for Christmas? Due to high demand, there simply are not any real airfare “deals” on the peak days around Christmas and New Year’s this year. Travelers who want the most convenient flights on their preferred airlines should book as soon as possible to get seats on those flights – otherwise they will likely be stuck paying the same high price for less desirable flights that depart super early or late, they’ll have to sit in those dreaded middle seats, or make several stops en route to their destinations. Should I drive or fly this year? I always stick to the five hour rule: If you can drive to your destination in five hours or less, it’s likely smarter to hit the road instead of the skies during the holidays. This is especially true for families traveling together. If you haven’t done so yet, download the Waze app, a GPS-based mapping tool that uses information provided by other drivers to help you avoid traffic, road hazards – and speed traps! What’s a good way to avoid holiday travel stress? Always try to book nonstop flights, because you double your chances of a delay or cancellation with a one-stop flight, even though you might save a few bucks. Another stress-busting move: Consider staying over in a hotel when visiting families during the holidays. Rates at new hotels like a locally owned Best Western in or near suburban office parks hit annual lows during holidays (due to the lack of business travelers), and facilities are usually new and nice. Having your own space at a hotel is a big relief for both the traveler and the host during the stressful holidays. Are there any alternatives or hidden secrets to getting good deals this year? If you have the flexibility to travel during the slowest times of year, the so-called “dead weeks” of early December and early January, you can save 50-70 percent on airfare or hotels. Some ski resorts will discount lift tickets during dead weeks. 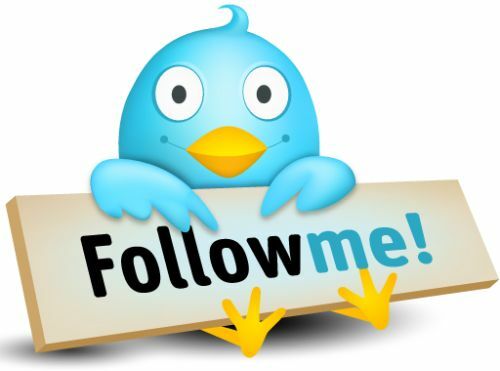 It’s also a good idea to check out airline or hotel social media streams on sites like Twitter or Facebook to look for short term, last minute sales. Is now a good time to redeem points or miles for trips? It’s nearly impossible to use airline frequent flyer awards during the blacked out, heavily restricted peak holiday season. On the other hand, demand for hotels declines during holidays, which means that it’s a lot easier to redeem those hard-earned loyalty points—or find good last minute deals. What about airline baggage fees? If possible, avoid checking bags during the holidays; the risk of your bag getting lost and ruining your trip is just too high. Try to learn to live out of a carry-on. If you have too much for a carry on, ship your bags ahead of time, but do so at the “ground” rate at UPS, FedEx or the Postal Service. Shipping a 25 lb. bag via next-day or two-day express is just too expensive. Do you spend a lot of time driving for business, but don’t like the thought of constantly looking at your smartphone as you try to stay in touch on the road? A new device makes it possible to handle communications and directions while you continue staring straight ahead at the road. 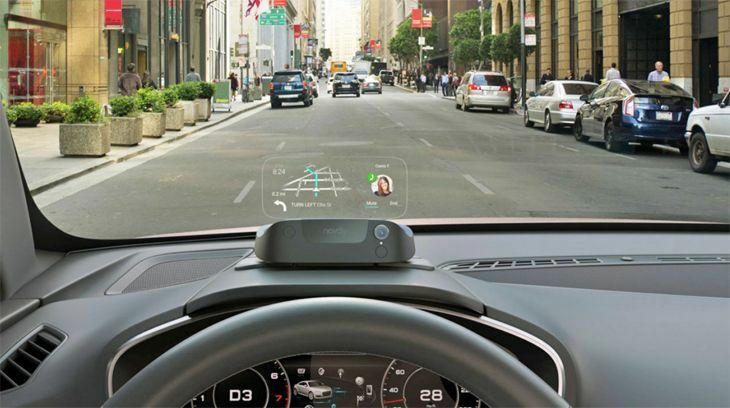 The new Navdy calls itself “the world’s first augmented driving device.” It links up with iOS and Android smartphones and projects information onto a small transparent screen that sits directly in front of the driver. 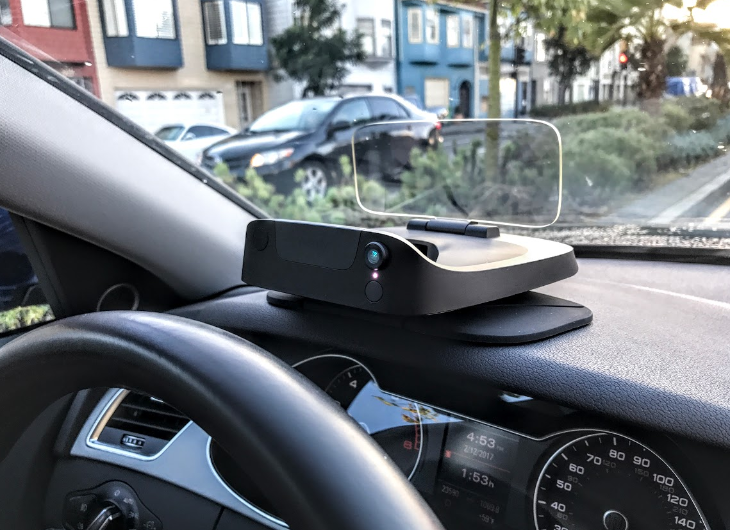 The Navdy device is fully portable, using a magnetic mounting system, and comes with a small dial that lets drivers scroll, zoom and navigate menus, and access Siri and Google Now. Drivers also have the option of using hand gestures to accept a call or message. Its navigation system is based on Google Maps, and directions are projected as a transparent image in front of the driver. “With its own high precision GPS chip and local storage of maps drivers don’t have to worry about losing navigation if they are out of network coverage,” the company noted. 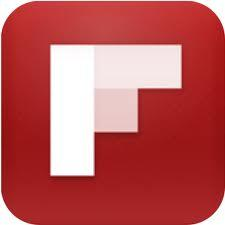 The product is currently priced from $71 a month, or $799 as a one-time purchase with no monthly fees. If you don’t like it, you can return the unit within 30 days for a refund. For details, go to www.navdy.com. The company said it will offer free same-day delivery at setup service for customers in the San Francisco Bay area, Los Angeles, Chicago, Manhattan, Dallas, Houston, Atlanta and Miami. On a recent trip to Sicily, I came to a stop sign on the main road from Palermo into Marsala, a small town on the western coast. I stopped. Immediately behind me, the cars started honking. I wasn’t sure what was going on. At the next stop sign, I stopped. Again, more honking and the car behind me came within inches of my rear bumper, indicating their displeasure with my actions. As I continued towards the town, I noticed all the cars ahead of me and cars coming from the opposite direction were completely ignoring the stop signs. Maybe they slowed down a little, but they went through them at 30 miles an hour. Later that night, I asked a local what’s with the stop signs. He laughed and said they were just a suggestion. If no one was coming from the side streets, he said the locals just ignored the signs. I forgot to ask him about the stop signs I saw at traffic lights which seemed to be completely illogical. Elsewhere in Sicily, drivers did stop for stop signs. For travelers, these local customs can be unnerving and strange. 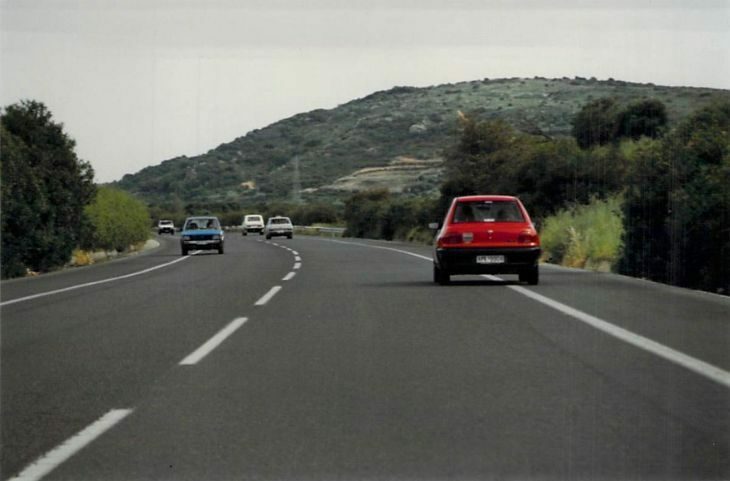 I started to think back on some of my more unusual driving experiences around the world. Related: Illegal to wear headsets when driving? 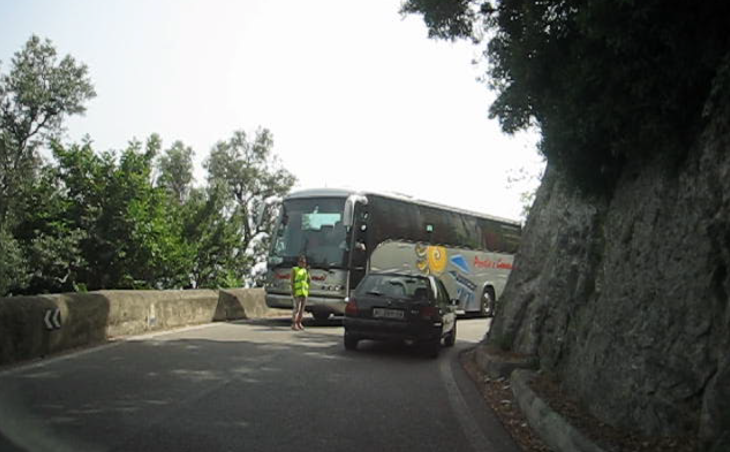 The drive along the Amalfi Coast is famous for the amazing scenery and the crazy hairpin turns on the edge of a cliff. But, the line in the middle of the road is treated as merely a suggestion, as long as you see no one coming in the opposite direction. If you hear a horn, it means a bus is coming around a blind curve and you might need to stop and back up. 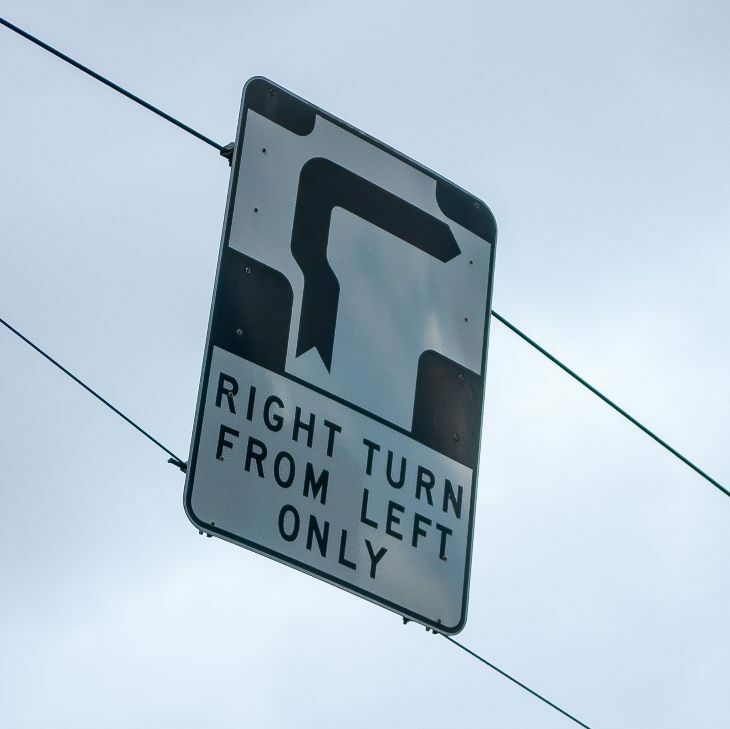 When driving in Melbourne, Australia, I learned about the crazy hook turn. If you want to make a right turn at an intersection, you actually start from the far left lane. You even drive a little towards the left before starting a sweeping right turn. The first time I drove it, I was shocked I actually made the turn without incident. Trams run down the center of the street where these turns are required and the procedure is said to reduce congestion and actually avoid accidents. In Buenos Aires, you need to watch out for taxicabs driving with their headlights off at night. If the cab drivers don’t have a fare, they don’t bother to turn on their lights. A local claimed this was done to save money. Back in the U.S., I had a strange driving experience on residential streets around Seattle. Many of the two-way streets allow parking on both sides of the street with room for just one car to travel in the center. When two cars meet, one has to find an empty parking spot to pull into or start backing up. I found myself in a few standstills with neither driver wanting to yield. I’m sure this is just a snapshot of international driving quirks. Share your experiences in the comments below. TravelSkills reader Jon Orlin (@jonorlin) enjoys traveling around the world. He was an Executive Producer at CNN for many years, and ran the video departments at Yahoo and TechCrunch. Would you like to submit a Reader Report to TravelSkills? We’d love to hear from you! Please check out our Reader Report Guidelines here and get busy! When you’re on the road in a rental car, do you rely on a mapping app on your phone to get you where you’re going, and to find the things you need along the way? Those apps are great — until you lose your Internet connection. 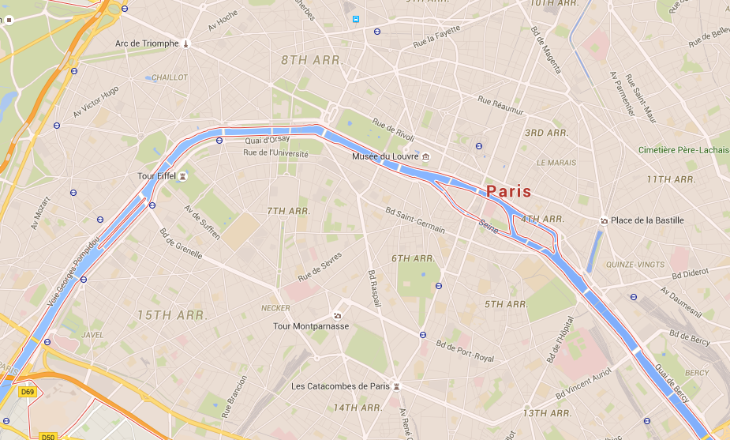 Now Google Maps says it has solved that problem with a new upgrade of its app. Users can now download a particular area or region to their phone, and if they lose connectivity, the app will still let them conduct destination searches, obtain turn-by-turn driving directions and find information about specific places along the way. New! Get $20 off your first Lyft ride! While business travelers may focus their complaints on air travel, the fact is that more of them get to their destinations by car than by plane — and there’s good news for drivers this week from GasBuddy, the website that tracks prices at the pump. 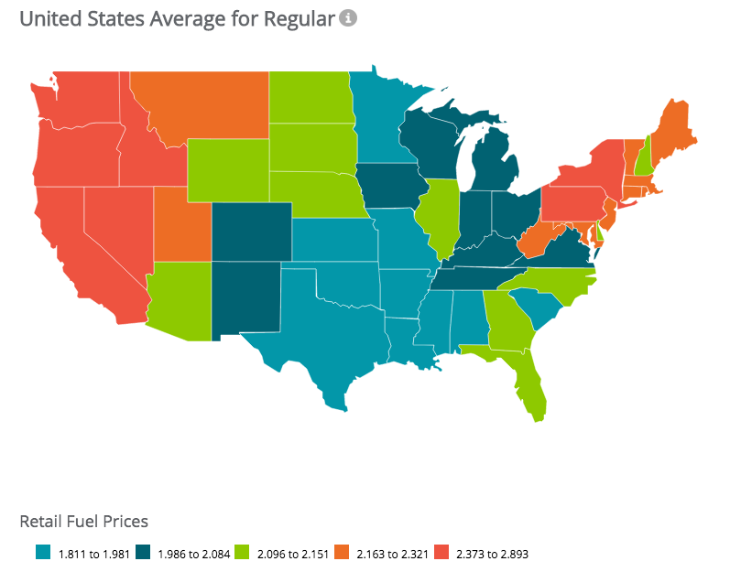 GasBuddy’s analysts are predicting that the national average price per gallon will drop below $2 by year’s end. Where is gas the cheapest? Look at the map above and you’ll see that it’s cheapest in the midwest and southern states, and most expensive in the west. According to GasBuddy, supply vs. demand trends going into the last part of the year will be putting downward pressure on crude oil prices — something they expect to continue well into next year. “Demand for gasoline slips in autumn and winter. At the same time, refining margins are strong and with the switch to cheaper winter grade gasoline in the coming month, ample supply of discounted gasoline will be available to motorists. It’s the perfect recipe for savings at the pump till the end of the year,” said Will Speer, another petroleum analyst for GasBuddy. 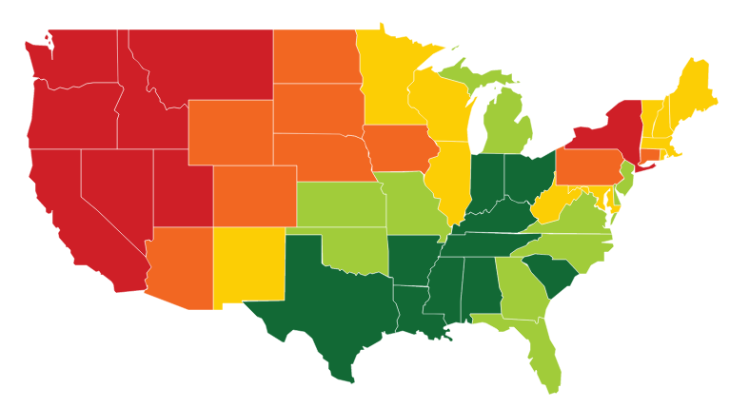 You can find state-by-state pricing information and graphics at GasBuddy’s website. How much are you paying per gallon this summer? Leave your price and comments below. Illegal to wear headsets when driving? If you rent cars in other states or countries frequently or plan a big summer road trip, bone up on laws regarding the use of headphones or earbuds while driving– or you could be hit with a big fine. Just last week France banned the the use of headsets while driving. 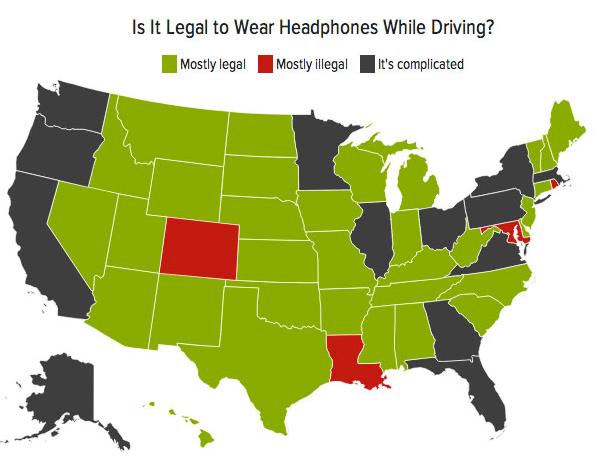 And did you know that drivers are forbidden from wearing headphones in Colorado, Maryland, Louisiana and Rhode Island? But it’s more complicated in other states. In California, Florida or New York, you can only wear headphones or ear buds in one ear, not both. In Illinois, only Bluetooth headseats are allowed. Fines for breaking these laws can range from $150 to $250. NOTE: Be sure to click here to see all recent TravelSkills posts about: Trip Report: SWISS Roche Coach + San Francisco mistakes + Planespotting 101: Airbus + Cool gasoline price heat map + More! Since most business travel is by car rather than by plane– and even if it’s by plane, there’s likely a car trip at one or both ends of the flight, we offer the following infographic as a public service. If you’ve ever wondered how to behave when pulled over by the police, here’s a good primer on what to do, and what your rights are. Have you ever been pulled over by the police while on a business trip? Share your stories below.